Maine Public Health: Downeast Trip Day #2 - Blueberries! 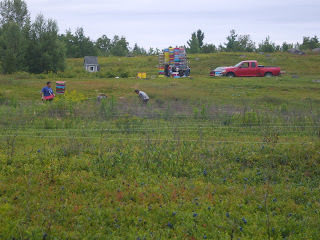 Downeast Trip Day #2 - Blueberries! The children and I enjoyed waking to the sounds of lobster boats motoring out to sea this morning. Walking over to Stinson’s cannery before breakfast, we joked about needing our rain gear to keep from getting “rained” upon by the hundreds of sea gulls who were hovering overhead, apparently attracted to the herring being loaded into the cannery. Although we were not allowed inside the factory, we did peek through the windows, and watched as thousands of herring and cans made their way on various conveyor belts and handled by men and women. After I made a comment about something being a red herring, my son asked me what the term meant and its connection to herring. I told him that the term refers to a false lead, but I didn’t know the connection to actual herring. I later looked it up and learned that “red” means smoked, and smoked herring can have such strong smells that they can be used to create a false scent that causes hunting animals (such as dogs) to lose their track. Interesting! By mid-morning, we had driven to Milbridge and met up with Anais Tomezsko, the Director of the Mano en Mano (Hand in Hand) Program, Barbara Ginley, the Director of the Maine Migrant Health Program, and Lisa Sockabasin, Maine CDC’s Director of Minority Health. Anais generously gave us a tour of Mano en Mano’s facilities and an overview of their history and programs. The program was started a few years ago after an influx of Latino migrant workers who decided to settle in the area. There is an estimated 300 such residents in Washington County, mostly originally from Mexico and Honduras. Although Mano en Mano has its roots in literacy – teaching preschoolers, school-aged children, and adults English – it includes some needed bridging between people living in the area. For instance, the program offers Spanish classes for area businesses and others as well as brings youth together to help each other with homework. They also have a health education program that focuses on immigrant women. Barbara, Lisa, the children, and I then drove several miles through some thick woods and blueberry barrens outside of Milbridge. I totally lost my sense of direction after a while, the curvy road wound its way through scenery that was solely woods interrupted by blueberry barrens. Finally, after a number of miles without any signs of houses or towns, we came across a migrant camp, maintained by one of the blueberry companies for their migrant workers to live while working for them. Although the camp houses about 300 workers, most were raking in the fields, so it was relatively quiet there. Rows of dozens of small blue camps framed a large central area that contained a soccer field, food vendors (all serving Mexican food), and bath houses. Ordering lunch from one of the vendors, I was surprised at how good the food was – tacos, burritos, and nachos, and all in the middle of woods and blueberry fields! Although there are other camps that also house mostly Hispanic migrant workers, there are also those that mostly house Native Americans. Northeastern Blueberry Company is owned by the Passamaquoddy Tribe, and employs many rakers who are Passamaquoddy and Mic Mac, including a number from Canada. We were fortunate that coincidently, Juan Perez-Febles arrived at the camp and joined us at lunchtime. As the Director of the Maine Department of Labor’s Migrant and Immigrant Services Division, Juan helps both employers and foreign workers. Since there are so many migrant workers this time of year in Washington County, he spends most of the month of the blueberry harvest here. Some of the workers who were having lunch greeted him, so it was evident he is well known. After lunch we drove across more winding roads through woods and blueberry barrens to the Rakers’ Center, held in and around the town hall of Columbia Falls. This central location to many of the blueberry barrens provides one-stop shopping for migrant workers for access to a number of services. For instance, in the parking lot was a large truck that serves as a food pantry, using surplus federal foods. Inside the town hall were several tables set up by various services, such as WIC, legal aid, and employment services. The main focus of our visit to the Rakers’ Center was the Maine Migrant Health Program’s mobile health clinic, also located in the parking lot. The visit was also a reunion of sorts with some wonderful friends. Mike Rowland, MD and Sara Roberts, PA were on duty. Mike was an emergency department physician when I practiced in Farmington, and Sara and I grew up in the same neighborhood in Farmington, and our families have been close for decades. Mike and Sara are some of a variety of medical personnel from across Maine who generously volunteer their services here. Their days are fairly long. The clinic is held at the Rakers’ Center during most days, then travels to different migrant camps most evenings. With two exam rooms, equipment squeezed into the small space, and a generator that provides some power, moving the unit around is no easy task. But, the effort appears to be well worth it. Last year they saw almost 1,200 migrant and seasonal workers. Although most blueberry rakers they see here are from Mexico and Honduras, most are young and otherwise healthy men. However, the work is quite hard, requiring long hours of being bent over and raking the wild blueberries. As a result, there are frequent back problems. The health clinic is able to provide some relief in the form of medicines (non-narcotic), physical therapy, and exercises. This treatment is crucial to keeping workers healthy and on the job. While I was visiting the health clinic, Lisa met with some summer interns who are working at the clinic. They are four minority students – Native American and Hispanic – who are getting an important introduction to the health field. During my brief meeting with them, I shared how much I hope they consider a health career, since minority students often serve minority populations more effectively than others. And, health careers are rewarding. I’m grateful that Lisa has helped provide such opportunities for minority students – an important investment in our future. During several stops today my children enjoyed trying out some of their elementary school Spanish with some of the workers we met. They were greeted with pleasant smiles and enthusiastic greetings. After spending most of the day with Barbara Ginley, Lisa Sockabasin, and in the morning Anais Tomezsko, the children and I drove eastward in the late day sun across miles of more blueberry barrens, many dotted with bent over rakers. I can see why migrant workers are considered so invisible – it took a day’s drive and travels on many back roads to even find some, and even then, most whom we saw were bent over, faces to the ground raking blueberries. How grateful I am to put a face on some of them, and for all the hard labor they provide in order to provide us healthy foods for our plates!